Ginger root tea is a light golden color, and the taste is spicy, hot, and sweet. The fresh root makes a slightly sweet tea, dried ginger is slightly hotter and drier. Ginger is one of my favorite teas, as a single ingredient and as an addition to other herbal blends. You should drink ginger tea daily for a healthy tonic. Hot ginger tea served with lemon and honey is a delicious way to control nausea of all types- especially effective in curbing motion sickness, morning sickness, and postoperative and chemotherapy-induced nausea. 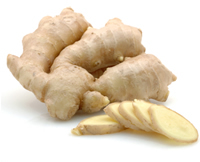 Ginger also improves digestion, which can prevent stomach upsets from occuring. The fresh grated ginger root, readily available at most food stores, is a great addition to herbal teas, adding a spicy, hot zest to your favorite dishes. The essential oil is marvelous in massage blends and aroma lamps. Ginger combines well with turmeric, which is also anti-inflammatory and pain-relieving.